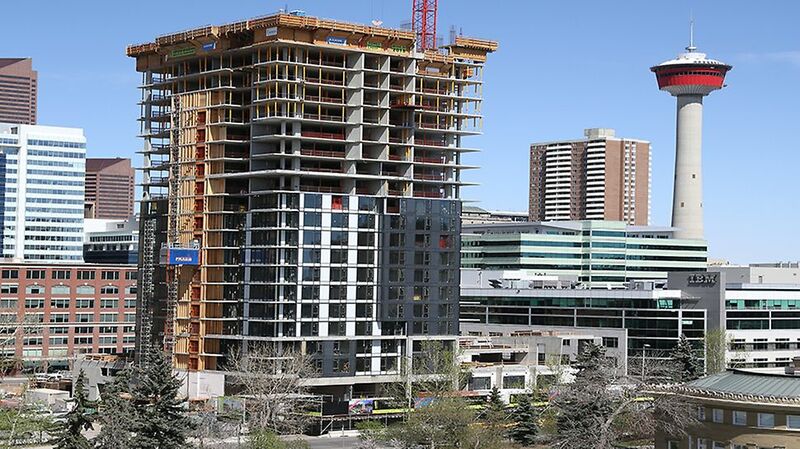 Located beside the historic Central Memorial Park of Calgary, Alberta, Park Point will feature luxury condominium units, offering protected park views in a centrally located area. 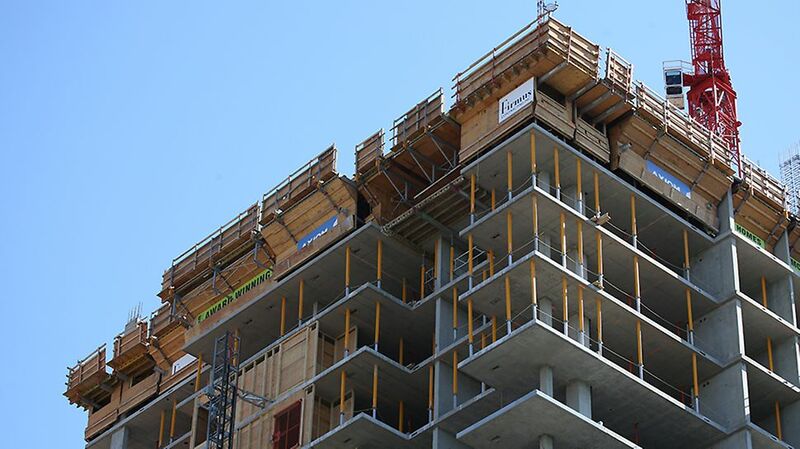 With over 50 years of experience in the construction industry, Firmus Contracting Inc. trusted the SKYDECK and SKYTABLE slab formwork systems to cast the concrete slabs at Park Point. SKYTABLE trusses are equipped with castor wheels and pushed out past the slab edge. Workers always remain on a safe and secure position on the slab. Repetitive assembly procedures associated wtih SKYTABLE accelerates shuttering - increasing productivity. SKYTABLE triple trusses can be moved remotely with only a single crane lift. We have been using PERI‘s SKYDECK and SKYTABLE system for many years. 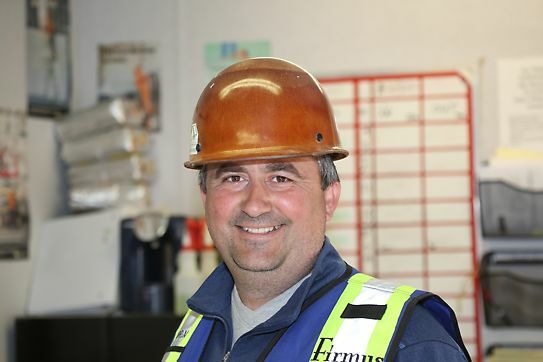 The PERI systems give us the ability to meet our tight schedules and deliver a high quality product for our precious customers, all while reducing manpower and time. 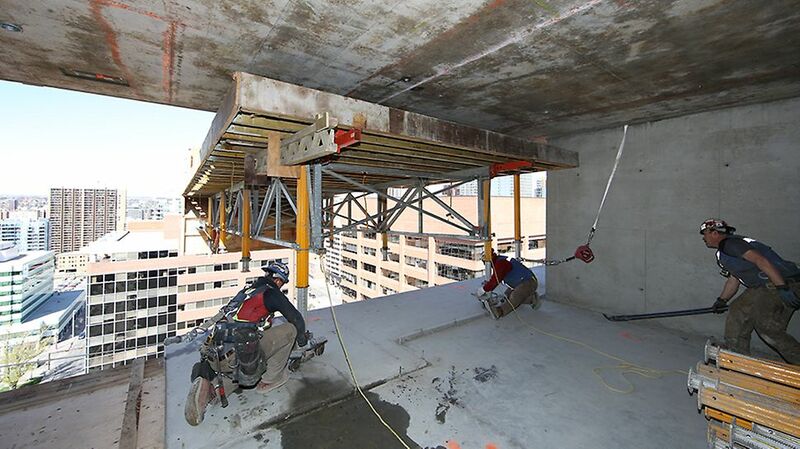 For the parkade levels, SKYDECK provided a lightweight system that could be shuttered safely and efficiently by hand. The system offers a simple systematic assembly sequence, without the need to measure; the predetermined prop spacing of 1.5 m by 2.25 m requires minimal planning on site. The prophead self-locking feature simplifies the attachment of the prop heads to the MULTIPROP props, making their setup quick and simple. The repetitive assembly procedure associated with the SKYDECK system accelerates shuttering, even when personnel are not experienced with the system. For the typical levels, SKYTABLE provided the slab formwork solution. The table lengths varied between 6.0 m and 13.5 m (the system can accommodate standard lengths of up to 24.4 m). For the wider bay areas, SKYTABLES fitted with the Horizontal Brace ST, were used in combination with three truss lengths in order to create 7.5 m wide table that could be picked by the Lifting Adapter ST with a single crane pick. A further advantage of the SKYTABLE system includes a winter protection solution; specially developed brackets and hinges provide the means for installing a plywood enclosure. Standard PERI braces, which are secured to the SKYTABLE trusses, ensure that the plywood remains in position. This solution provided fall protection along the slab edge and created a closed off working environment that was heated during the winter months. This was an important feature that led to an increase in productivity. PERI‘s unique method of flying the SKYTABLE is safer and requires less time to cycle material from one level to the next. The tables are always flown from a safe and secure position on the slab above by site personnel who remotely operate the Lifting Mechanism STM. The crane slowly lifts the STM, pulling the table out of the building until such time as it is “flying” (fully supported by the crane); during this process, the remote control is used to keep the table horizontal. 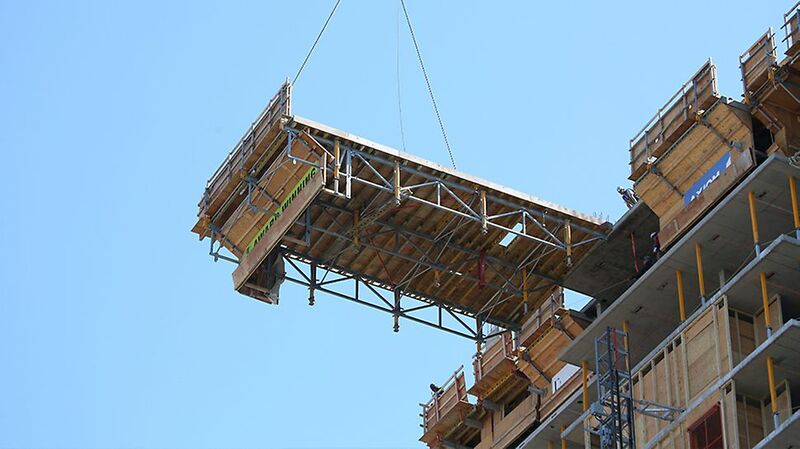 Each SKYTABLE is moved from one position to the next with a single crane lift.